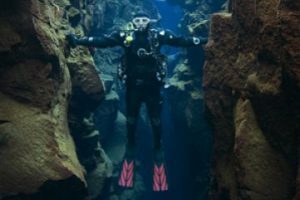 Iceland Diving with Island Divers! 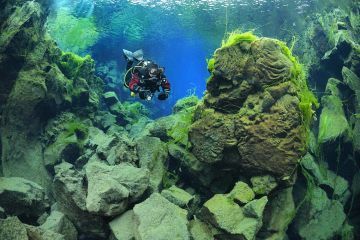 On the first day of our tour, we went to the most popular dive and snorkel site in Iceland, Silfra. 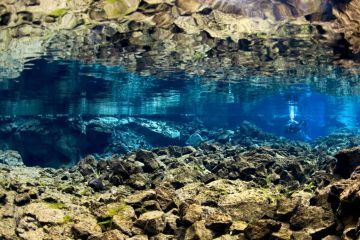 The dive site is located in the National Park Þingvellir, about a 45 minute drive from Reykjavík. The Park has been declared a world heritage site by UNESCO, both for its cultural & historical significance as well as natural & geological uniqueness. On our way the guide pointed out interesting facts about the history and geology of the park. When we arrived at the dive site we donned out dive equipment and walked to the platform, where our guide gave us our briefing on the first dive. We took a few steps down the ladder and make contact to the world’s clearest water to dive in. It‘s so pure you can even drink it – and some of us did just to make sure! The slight current formed by the underground wells made our dive in the crack an easy one. Our dive guide led the dive and took photos and videos of us all which we were able to purchase for our own memories. After the first dive we took about an hour break and have some hot chocolate and cookies. 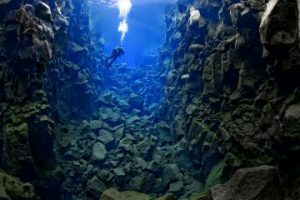 We planned our dives so that we saw Silfra Hall, Silfra Cathedral and the Silfra Lagoon on both dives. On the second day we visited geothermal hot spring areas both underwater and on land. The volcanic landscape of the area is stunning! Only 30 minutes out of Reykjavík, you will experience complete tranquility in the most beautiful surroundings. The underwater hot springs have just recently been discovered and the dive site is just a 10m swim away from the beach of the lake. This is most likely the only dive site you can hear before you can see it. In order to get to the dive site we had to take our 4×4 dive bus, since only rugged tire tracks lead to this site in the middle of nowhere. Close to the beach we parked the dive bus and walked down to the water to have our briefing on the geologically unique dive site. If the wind direction is right, you can already smell the hot springs. We put on our gear and walked to the entry point. When walking into the water to put on our fins and mask you could already see the white and yellow sulphur deposits on the lake floor and the gas bubbles coming up in between. In the centre area of the hot springs is a crater in the lake floor where a lot of water and gases come up. When diving into this hole, one has the feeling of diving into an earthquake because the air bubbles coming out of the ground creates pressure that lets the rocks vibrate. Divers can feel these vibrations deep into their bones. A very special experience! After the dive we packed our gear together and drove back along the tire tracks to Krýsuvík, a geothermal hot spring area nearby. In Krýsuvík we marvelled at the mud pots and hot springs and the colourful sulphur deposits before we made our way back toReykjavík. Some of us took our swimming clothes and were dropped off at one of Reykjavík‘s wonderful geothermal pools where we could hang out in the hot tubs and end the day the geothermal way!